JOHN TYLER. 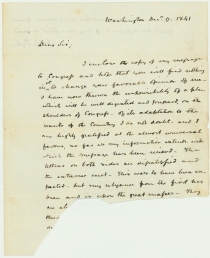 Autograph Letter Signed as President. Washington, D.C., December 9, 1841. 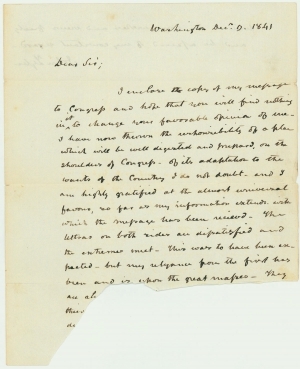 2 pp., 8½ x 11½ in., roughly torn, with lower quarter and at least three lines of text lacking, but signature intact on verso. I enclose the copy of my message to Congress and hope that you will find nothing in it to change your favorable opinion of me. I have now thrown the responsibility of a plan which will be well digested and prepared, on the shoulders of Congress. Of its adaptation to the wants of the country I do not doubt, and I am highly gratified at the almost universal favor, so far as my information extends, with which the message has been received. The Ultras on both sides are dissatisfied and the extremes meet—this was to have been expected—but my relyance [sic] from the first has been and is upon the great masses--they are al...xxxx...their...xxxx <2> write to me your wishes and views freely and be assured of my constant regard. Following the Panic of 1837, fiscal policy was at the top of the government’s agenda. 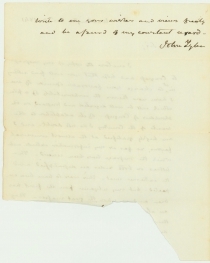 When John Tyler assumed the presidency after the untimely death of William Henry Harrison after only a month in office, Whig leaders such as Henry Clay expected Tyler to work closely with them to follow Harrison’s policies. At first Tyler played the role, but on pivotal issues he rebuked Whig advances. His reference to the “Ultras” refers to the Clay faction of the Whig party as well as the Democrats who. While there was room for compromises on issues of the protective tariff, Tyler twice vetoed acts to reestablish a national bank. Following the second veto in September, the bulk of his Cabinet, holdovers from Harrison’s administration, resigned in protest. John Tyler (1790-1862) was the first president to be elevated to office from the vice presidency upon the death of William Henry Harrison after only a month in office. His ascension led to the Constitutional question of whether he was actually president or still the vice president merely performing presidential duties. From his perspective, he had assumed to office and delivered an inaugural address. Dubbed “His Accidency” by critics, Tyler refused to fall under Henry Clay’s influence and instead charted his own course as president, leading to vetoes, Cabinet resignations and an impeachment attempt.